We help our clients to maximize individual, team, and organizational performance. Consultative Services That Promote Peak Performance and Organizational Excellence! The experts at Organization Development Consultants, Inc. (ODC) work with top leaders at organizations of all kinds, including mid- to large-size companies, professional service organizations (such as health care and institutions of higher learning), public sector employers (including public safety), and non-profits (including churches) to help their organizations achieve peak performance. We align our clients’ talent with organizational goals and key performance indicators (KPIs) for employees, operations/processes, customers/constituents, and financials. Our evidenced-based approach leads to demonstrable results for organizations—including increased profits, heightened customer satisfaction, enhanced operational effectiveness, and greater talent retention and employee engagement. Learn More: Call us in Brookfield, Wisconsin, at 262-827-1901. Practical advice to drive organizational performance. Timely creation of hard-hitting, actionable plans. Programmatic and outcome evaluations to identify performance relationships and impact on business (IOB) to enhance problem solving and decision making relative to resource allocations. In order to build an environment of peak performance, sustained excellence, and employee engagement, ODC offers organization development services including organizational studies/surveys, change management, conflict resolution, culture analysis, and process consulting. Leaders drive organizations. We help to maximize this dynamic relationship. A dynamic process for engaging all employees of an organization that it is positive, constructive, and inclusive. “Real time” counsel with individuals to enhance their contributions to the organization. In order to document strengths and developmental areas, ODC offers reliable and valid assessments for use with individuals, teams, and organizations. The “target” or “aim” of organizations that seek to be different and distinctive. Promulgation of an holistic view of organizational success, encompassing a robust array of key performance indicators, consistent with a multiple stakeholder perspective. The Three C’s of the external business environment. Leaders must monitor these elements in order to encourage organizational innovation. A discipline for seeing wholes. It is a framework for seeing interrelationships rather than things, patterns of changes rather than “static snapshots,” and the structures that underlie complex situations, as well as for discerning high from low leverage change. The recognition that the workforce is populated by “whole people.” Pursuit of quality of work life initiatives that promote the fullest possible personal-professional balance for employees at all levels. A perpetual sense of building, fine-tuning, fueled by positive restlessness. An “organizational curiosity” about what the organization might become. A zeal to pursue the future and to make things happen. The Three P’s of the internal business environment. The building blocks for encouraging peak performance among individuals, teams and work areas, and the organization at-large. An overriding concern with corporate culture (i.e., “the way we do things around here”). The belief and understanding that the other bottom line drives performance relative to the bottom line. ODC’s Peak Performance System (PPS) is a dynamic model of focal points and services to enhance organizational effectiveness. In the graphic above, the center circle or bull’s eye is the target at which peak performance organizations aim; the goal is to become great and stay great by achieving peak performance. The outer ring is comprised of focal points that leaders at peak performance organizations must consider if they are to adopt and pursue “staying great” and peak performance practices. 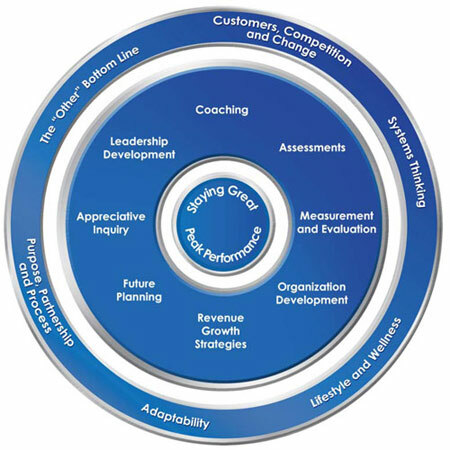 The second ring highlights service areas in which ODC offers consultation, addressing the focal points in the outer ring and translating them into tangible, actionable pursuits that demonstrably impact organizational, team, and individual effectiveness, resulting in “staying great” and peak performance that can be sustained over time. Click on the elements of the graphic to see more!